This chandelier is Devine. I absolutely love it. The light it provides radiates throughout the whole room. I love the richness of the texture and appreciate the simplicity at the same time. I would definitely recommend but this piece of lighting. The minimalist interiors of the apartment of a top Italian designer inspired this contemporary pendant. 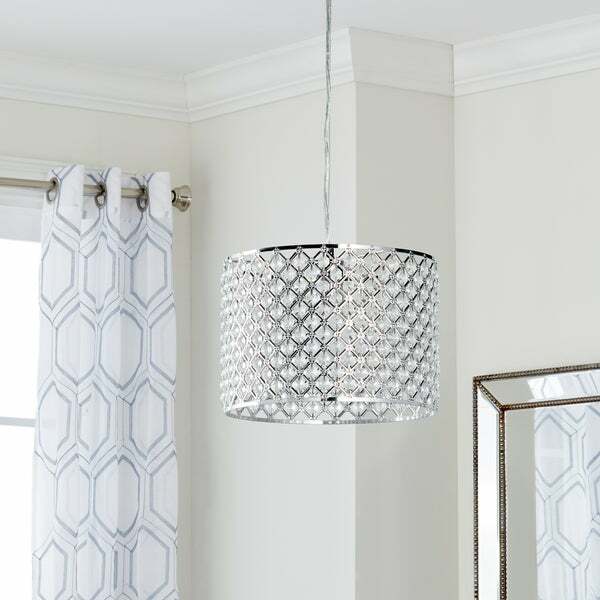 Ideal for the home of the modern jetsetter, its chic metallic chrome finish is paired with shimmering crystal beads in a diamond pattern. Dimensions 12" X 12" X 13" - 82"
its a gorgeous piece. I used it as kitchen pendant lights and they look glamorous. The installation was easy but took time since I did it myself. We just love it. Very pretty to hang as a pendant light above our kitchen sink. We didn't want just small one. Wanted a sparkle type light that's very bright. Husband put up in 20 minutes. Cut back some of length & worked perfect between the cabinets & lined up with new chrome faucet we also got from Overstock. So many new lighting we got in last 12 months to upgrade our home. Overstock has such beautiful things with great pricing. My Overstock card is my favorite card to do many upgrades in home. Not having to run around home improvement stores looking & finding what we like. Overstock has many choices & modern is our way we wanted upgrades. Overstock has everything we needed or need in our total house upgrades. Inside & out. Thanks Overstock, you rock!! This light is beautiful and is exactly as pictured. You can tell it is made of quality materials. The “crystals” sparkle beautifully. Perfect for my entry. The light itself worth 3 star although the quality is mediocre. But you can’t really see after hanging on ceiling. But I was looking for something in better quality and this is clearly not it. Customer Service was bad - reported the item not match description as actual item received is acrylic beads, not crystal and not iron. Customer service immediately offered a "replacement", I asked in chats a few times if it means they actually have an item matching description but without answering. Since the replacement order was initiated, I assumed that was the case and received the exact SAME items. Felt like I was dealing with robots. Very disappointed and wasted my time to wait for 2 delivery and back to square one. Still giving a try on other overstock items as I do like the fast shipping. Looks modern and chic. Arrived in time. This little light is absolutely glamorous. It's a little smaller than I thought however it works with my décor and I really do love it. This is beautiful and very chic. However, I do feel disappointed that the glass pieces seem more like it’s plastic and it doesn’t sparkle like I hoped. Great light! I used it in a bathroom and it was perfect for the space. Looks very nice in my living room ceiling. Love the quality and it was easy to assembled. Great price and elegant in my teens room! Great lamp fast delivery ,thanks. "Can you buy additional chain to make it longer?" "If hung as a swag pendant, is there a switch in the wire somewhere? Is there a plug on the end of the wire?" "How much light does this give off? We are looking for a pendant light for kitchen island. We have vaulted ceiling (11 ft). Curious as to whether or not in a larger room if the amount of light will be sufficient." This item gives off 830 lumens.